MRSA (Methicillin Resistant Staphylococcus Aureus) infection is a kind of infection that is caused by staph bacteria. These bacteria are usually found on the skin or the nose and become resistant to the antibodies that are used to treat the staph infection. If left untreated, the infection may cause several complications. Hence there is a strong need to treat this infection. Herbal medicines offered by Ayurveda are a natural way to manage this infection. Methicillin-resistant Staphylococcus aureus (MRSA) infection is of two types. The one which occurs in people who are working in health care centers is known as HA-MRSA infection. While the one which occurs in healthy people, in a wider community, is known as CA-MRSA. 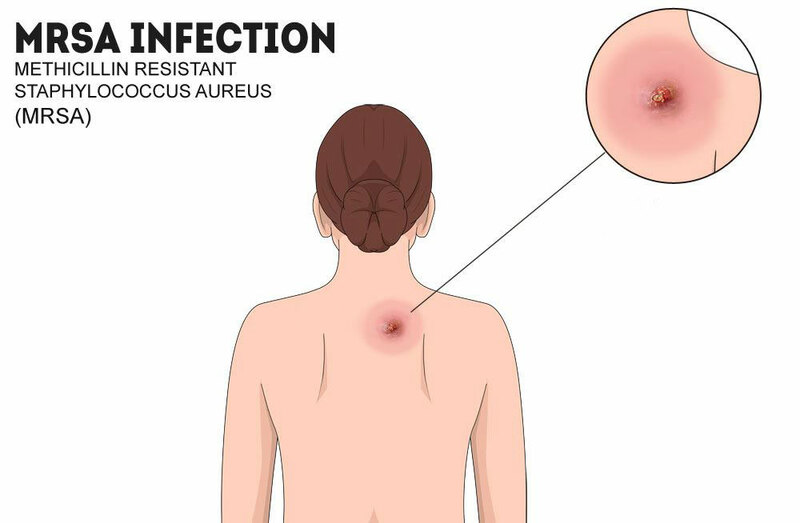 Appearance of painful red bumps filled with pus or other drainage is the primary symptom of MRSA infection. These bumps are similar to the pimples or the spider bites. The infection is often accompanied by the fever. A group of various different varieties of Staphylococcus aureus bacteria is commonly known as "staph". MRSA infection is caused by this staph bacteria. Such bacteria are generally harmless but once they get entry into our body through wounds or cuts, they may result in serious infection. MRSA infection can be checked by doctors using a tissue sample for signs of drug-resistant bacteria. As the bacteria is found on the nose also, nasal secretions can also be used for diagnosis. The sample is then tested in a lab where it is placed in a dish of nutrients that encourage the growth of the bacteria. This testing will take at least 48 hours for the bacteria to grow. Hence, there are some newer tests which can detect staph DNA in a matter of hours and are now becoming more widely available. Ayurveda is an ancient health care system that has its roots in India. Treatment offered by Ayurveda is based on the idea of balance in the bodily systems. The treatment also uses diet, herbal medicines and yogic breathing to manage the symptoms of any disorder. Herbal treatment gives a permanent relief from the symptoms. No doubt, MRSA infection can be well treated with medicines, but here are some ways that can help prevent the spreading of this infection. If you are suffering from MRSA infection, then you should cover your wounds with clean, dry bandages until they get healed. As the pus in the infected wound may contain MRSA, so keeping the wound covered will help prevent the spreading of MRSA to others. Bandages and tape should be thrown away after using. Clean your hands often with clean soap and water. Family members or anyone who is in close contact with you, should also wash their hands. You can use an alcohol based hand rub especially after using the bandage or touching the wound. A person suffering from MRSA infection should not share his personal items such as towel, washcloth, razor, clothing as well as uniform. Used sheets, towels, and clothes of an infected person should be washed properly with water and laundry detergent. You can use a dryer to dry these things completely. As herbal medicines are prepared with natural herbs, these medicines are natural way to cure any disorder. Being natural, these medicines are safe to use and reduce the risk of side effects.Planet Ayurveda offers herbal medicines for MRSA infection too. 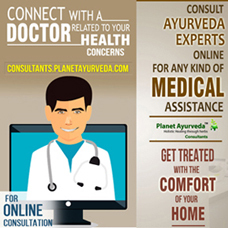 Planet Ayurveda offers best quality herbal medicines that are 100 percent pure and natural. All the medicines by Planet Ayurveda are free from chemicals or additives or preservatives and hence are safe to use. All of them are free from side effects. The Gandhak rasayan herbal tablets are made using pure Gandhak (Sulfur purified). The medicine is effective in controlling the symptoms of MRSA infection up to a very good extent. Pack Size :- One bottle contains 120 tablets. Dosage :- 2 tablets, two times a day, with plain water, after meals. 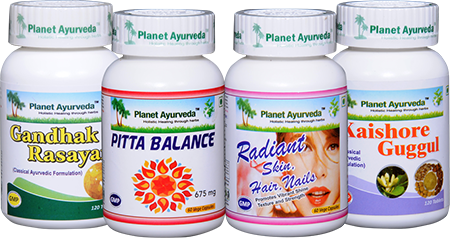 Pitta balance capsules by Planet Ayurveda are made using a special combination of 5 ingredients. The ingredients include Praval pishti (Coral calcium), Akik pishti (Agate calcium), Kamdhudha ras (Calcium compound), Mukta pishti (Pearl calcium) and Giloy satva (Tinospora cordifolia). This herbal capsules are the great way to balance the pitta dosha of the body. Pack Size :- One bottle contains 60 capsules. Dosage :- 1 capsules, two times a day, with plain water, after meals. Kaishore Guggul is another herbal product from the house of Planet Ayurveda for MRSA infection. This product is made using a special combination of 7 ingredients. The ingredients include Guggulu resin (Commiphora mukul), Ginger root (Zingiber officinale), Guduchi herb (Tinospora cordifolia), Pippali fruit (Piper longum), Black pepper fruit (Piper nigrum), Danti root (Baliospermum montanum) and Nishoth root (Operculina turpethum). All of these herbs are frequently used in Ayurveda. Pack size :- One bottle contains 120 tablets in it. Radiant skin hair nail formula capsules by Planet Ayurveda are also a great way to manage the symptoms of MRSA infection. As the name suggests, this herbal product is helpful in maintaining healthy skin as well as nails and hairs. The capsules contain the pure and standardized extracts of useful herbs such as Rubia cordifolia, Fumaria officinalis, Swertia chirata and Aloe barbadensis. All of these herbs are highly beneficial.